The Liberal Democratic Party (LDP) will publish an apology in the April 21 issue of party organ Jiyu Shimpo for articles which appeared two years ago in the paper on Soka Gakkai Honorary President Daisaku Ikeda. The LDP admits to having "failed to conduct an adequate investigation of the facts ... [and] the inappropriateness of having, in effect, permitted the spreading of falsehoods. For this we apologize. The articles in question, which made their first appearance from January 1996 featured a dispute between Mr. Ikeda and a former Soka Gakkai member. The lay Buddhist organization submitted a letter of protest to the LDP that notes, "Mr. Ikeda's reputation and rights were gravely injured." Upon receipt of the letter, the LDP decided to publish a retraction under the name of party Public Relations Headquarters Chief Hajime Yosano along with the Soka Gakkai protest in the Jiyu Shimpo. The party informed the Soka Gakkai of its decision on April 17. In the April 21 issue of the Liberal Democratic Party (LDP) organ, "Jiyu Shimpo," LDP Public Relations Headquarters Chief Hajime Yosano will "express our profound regret" for a previous series of articles carried by the paper featuring an alleged scandal between Soka Gakkai Honorary President Daisaku Ikeda and a woman. Soka Gakkai organ Seikyo Shimbun will also publish the LDP retraction on the same date. The serial, which took up a case of a Hokkaido woman and former Soka Gakkai member who filed for monetary redress in a civil suit against Mr. Ikeda, appeared in the LDP organ between January 1996 to October 1997. In the LDP retraction, Mr. Yosano concedes, "...we failed to conduct an adequate investigation of the facts and focused solely on the assertions of one of the parties to the dispute...we must acknowledge the inappropriateness of having, in effect permitted the spreading of falsehoods. For this we apologize and express our profound regret." The Soka Gakkai and Liberal Democratic Party (LDP) have arrived at a settlement over articles on Soka Gakkai Honorary President Daisaku Ikeda that were published in the LDP organ, Jiyu Shimpo, which the lay Buddhist organization has protested as being erroneous. 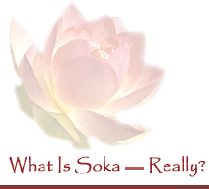 The articles in question, written by a freelance journalist, were serialized in the paper in 1996 and featured the relationship between the [now-dismantled] New Frontier Party and Soka Gakkai. They carried allegations by a former Soka Gakkai member claiming to have been assaulted by Mr. Ikeda. On April 13, the Soka Gakkai sent a letter of protest which notes, "These articles contained many instances of what must be termed a grievously libelous nature," to LDP Secretary General Koichi Kato. In response, the LDP will issue an apology by the party's Public Relations Headquarters Chief Hajime Yosano that will appear on the April 21 issue of Jiyu Shimpo.